Although Jim Miles probably covered it to some extent in one of his myriad of touring books, the Battle of Murfreesboro still has no book length battlefield guide devoted to it. However, in December 07, the Spruills's Winter Lightning: A Guide to the Battle of Stones River (University of Tennessee Press) will be published. Previous collaborative efforts from the author cover The Seven Days , Chickamauga , and Chattanooga . Readers familiar with the US Army War College Guide series will recognize the structure. While I own many of them and have found them to be useful, I have mixed feelings about the O.R. text heavy format. In general, the series published by the University of Nebraska Press comes closer to what I want in a field guide: maps (and more maps), concise text, photos, and detailed orientation information. Hurst: "Men of Fire: Grant, Forrest, and the Campaign That Decided the Civil War"
While two book length, scholarly studies of the Forts Henry and Donelson campaign exist [B.F. Cooling and Kendall Gott ], Jack Hurst's new account, Men of Fire, is a popular style traditional narrative history of this important series of events. It's a character driven story, centering on U.S. Grant and to a lesser extent Nathan Bedford Forrest. While light and engaging, the flaws of the narrative style become apparent, with the well developed protagonists set upon by the one dimensional supporting characters (e.g. Grant vs. Halleck, Buell, Kountz, McClernand, and McClellan) that seem to exist only to thwart them. Much of Grant's aggressiveness (and even recklessness) is attributed by Hurst to the general's constant fear of being replaced by distrustful, vindictive superiors and/or rivals with powerful political connections. Forrest is not as essential to the story. Readers unaware that the author is a Forrest biographer might well be baffled by Hurst's co-emphasis on the talented but still relatively obscure Lt. Colonel of cavalry. The bibliography is limited, with only a handful of unpublished materials consulted. A notable omission among the secondary sources is Gott's Where the South Lost the War: An Analysis of the Fort Henry-Fort Donelson Campaign, February 1862. This is strange as Hurst shares much the same view of the decisiveness of the campaign and his treatment of Simon B. Buckner is quite similar to Gott's. The decision to include reproductions of the Bearss-Cooling map study in Men of Fire is welcome. I was unaware of their existence and was pleasantly surprised to see these wonderful hand-drawn maps. At regimental scale with rich depiction of the terrain, they detail the decisive day of the campaign (Feb. 15) in one hour intervals. What should we make of this study in the end? It is not as comprehensive as Cooling's study and cannot match its depth of research. In analysis, Gott remains superior and more original. However, Men of Fire is not without its charms. The maps alone make it worthy of consideration for deeper students of the campaign and it does illuminate some obscure events (such as the Kountz charges against Grant). Rather than fill up the sidebar with links to publisher websites, I've created an Other Publishers page. The subjective (yes, subjective, so no complaints) criteria for inclusion are explained there fully. 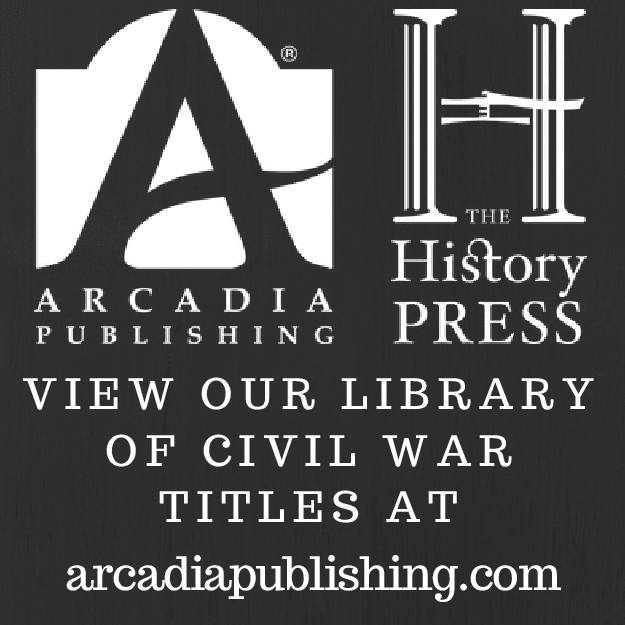 To visit, either click on the link above or find the last entry of 'Civil War Publishing Links' in the sidebar. Earthen Walls, Iron Men: Fort DeRussy, Louisiana, and the Defense of Red River -- by Steven Mayeux (University of Tennessee Press, 2007). For me, this is one of the most anticipated Trans-Mississippi titles for the year. 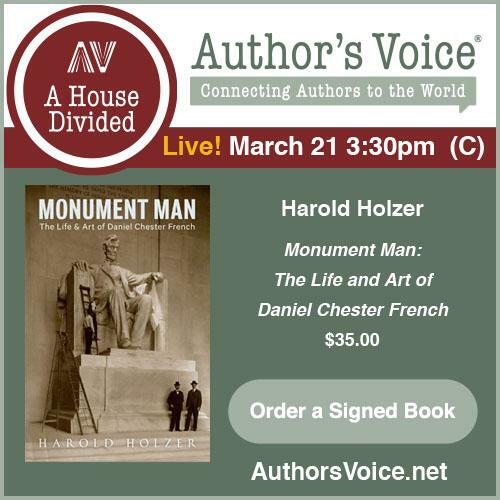 Also a dedicated preservationist, the author is president of the Friends of Fort DeRussy. The Battle of Natural Bridge, Florida -- by Dale Cox (Dale Cox, 2007). The March 1865 Confederate defense of Tallahassee, Florida. It's a completely revised and expanded edition of Cox's 2001 publication, and a nice follow-up volume to his excellent recent work on the Battle of Marianna, see review. Monocacy: The Battle That Saved Washington by B.F. Cooling (White Mane, 1997). I finally purchased a personal copy of this great study, which should have made my "Best of White Mane" series of posts way back when. With a new interest in Early's valley high jinks, I am looking forward to re-reading it. I was also going to comment on a brand new publication about this battle but I think Eric summed it up well enough on his blog. Bailey & Sutherland: "Civil War Arkansas: Beyond Battles and Leaders"
Civil War Arkansas is a collection of exceptional essays covering a wide range of topics. Previously published (mostly in Arkansas Historical Quarterly), each article was carefully chosen by editors Anne Bailey and Daniel Sutherland to illuminate an under appreciated facet of Arkansas's war. However, for me, perhaps the most priceless entry is the introduction. Bailey and Sutherland provide the reader with a phenomenally thorough survey of the literature of Civil War Arkansas, while at the same time tracing and evaluating the evolving trends of academic writing. This essay alone is worth the price of the book. If this wasn't enough to keep an interested student busy for years, the content of the notes only add to the pile of must-read books, articles, theses, and dissertations. At the heart of this collection is Sutherland's notion that the guerrilla conflict was "the" war in Arkansas, with large scale regular operations the infrequent exception to the rule [an interpretation developed in Chap. 7, his own contribution to the collection]. Carl Moneyhon writes of a Unionist uprising in SW Arkansas, and the relationship of class to anti-Confederate feeling in the region. The story of the Unionist Williams family of northern Arkansas is told by Kenneth Barnes. Some regular operations are covered, with Anne Bailey's article demonstrating how the influx of Texas regiments saved a denuded Arkansas in 1862 and Jayme Stone's recounting of military operations along the Arkansas River in the winter of 1864-65. Several articles attend to socio-economic matters. Michael Hughes writes of a Federal policy developed to protect Unionist citizens and at the same time strike at the economic heart of the Confederates. He details both sides' targeting of grist mills for destruction and the formation of Unionist farming colonies [I recommend Mackey for further reading on this fascinating subject]. James Johnston contributed a remarkably thorough article and appendices discussing the activities of the Confederate Nitre Bureau in the state. Kim Allen Scott views the war at a more personal level, examining the destruction wrought upon the property of select individuals by marauding soldiers. Two chapters specifically address the issue of race, but in differing contexts. In Chapter 9, Carl Moneyhon spells out the failed Federal plan to lease plantations to freedman as an introduction to free labor and society. Gregory Urwin tackles an especially difficult subject in his essay. He attempts to understand what factors led Confederate soldiers (white and Indian) to kill wounded and surrendering U.S.C.T. soldiers during the 1864 Camden Expedition, and analyzes the reprisals that stemmed from these incidents. William Shea's essay is fascinating and undoubtedly controversial. Most readers, however, will find it appropriate and I commend the editors for choosing it. It traces the perception of Arkansas and Arkansans from antebellum times through to today, and sensitively attempts to explain what is behind such a persistence of negative stereotyping from without. In my estimation, Civil War Arkansas is one of the finest essay collections in the literature. There isn't a single chapter I would wish to discard in favor of another. The only complaint I have is that no maps were created specifically for any of the articles. The single state map provided is far too general, leaving out the vast majority of geographic features mentioned in the text. It amounts to only a minor quibble in this case, however, and does not detract seriously from the book's overwhelmingly positive qualities. Expertly edited, the compilation also has the uncommon quality of having no weak links and very little overlap. Those readers wishing to pursue inquiries of their own will appreciate the extensive endnotes. Highly recommended. Men of Fire -- by Jack Hurst (Basic Books, 2007). I've already finished this one, and a review should be up soon. Success Is All That Was Expected: The South Atlantic Blockading Squadron During the Civil War -- by Robert M. Browning (Potomac Books, 2005). A recent purchase. I've been meaning to read this one and its companion volume about the North Atlantic Blockading Squadron for some time. Derelicts: An account of ships lost at sea in general commerce traffic and a brief history of blockade runners stranded along the North Carolina coast 1861 - 1865 -- by James Sprunt. Civil War Weather in Virginia -- by Robert K. Krick (University of Alabama Press, 2007). Should be a very valuable reference work. The Irish General: Thomas Francis Meagher by Paul R. Wylie (University of Oklahoma Press, 2007). I can't say that I've had any compelling interest in Meagher, so this one arrived out of the blue. Looks like some hefty content on his post-war career in the west. He was governor of Montana, and apparently his statue in the capital is not at all a universal source of pride there. Fitful trip on the "Road to Disunion"
For the past few months now, I've been picking my way through the first half of William Freehling's Road to Disunion (Vol. 2). This snail's pace almost matches that of my personal record-holding reading of Jacques Barzun's crusty fountain of erudition From Dawn to Decadence . Generally, I am a fast reader, but books that are so obviously the distillation of an entire life's work by a talented scholar take time. Hopefully, finishing Freehling won't consume the year and a half it took me to complete Barzun. While the reader would undoubtedly be richer for it, one gets the impression that a thorough reading of Vol. 1 is not necessary for an adequate contextual understanding of the second book. Freehling begins Secessionists Triumphant with a nice summary of his concept of the three Souths (Lower, Middle, and Border)-- he even throws in the helpful notion of a distinct Border North. This conceptualization is fully defined in previous works by the author, and it is a critical cog in understanding the common theme throughout Road to Disunion of a very divided South (politically, economically, and socially). Freehling moves on to a survey of the southern pro-slavery intellectual tradition, characterized by the writings of men such as George Fitzhugh, Josiah Nott, and James Thornwell. Some Deep South thinkers struggled almost as much with the place of poor whites as they did with blacks, even to the extent of the need to enslave poor whites (an unpopular idea quickly recanted). Part IV is perhaps the most enlightening section of the book's first half. While all readers have heard of John Brown and his plan to destroy slavery with the sword, many, perhaps most, are unfamiliar with the other "invasions". Freehling's detailed examination of John Fee's religious invasion, John Underwood's economic invasion, and John Clark's political invasion broadens and multiplies the catalog of fears -- both real and abstract -- held by southerners. In the process, it vastly increases our understanding of just how besieged the ruling class perceived itself and how differently the threats were assessed by citizens of the three souths. What is unclear is how much or little impression these issues made in the minds of the average, lower class, non-slaveholding southern citizen [most unfortunately labelled "rednecks" by the author]. The election of 1860 is dealt with in Part V. Of course the subject is heavily covered in the literature, but Freehling's contribution is important. It centers around how differently politicians viewed the depth of the threat of a Republican administration to the South's institutions. Were these fears immediate and real or were they best characterized as legitimate abstractions and only time would tell if they would come to fruition? It undoubtedly infuriated Deep South politicians that the Border South had the highest pressure on the institution of slavery yet were the most reluctant of secessionists. It made them deeply question their fellow southerners on their "soundness" on the issue. Freehling cannot be put in the school of thought that the Civil War was inevitable. Individuals of power and influence can steer masses of reluctant constituents toward secession, yet those individuals are subject themselves to the randomness of events. Timing can be everything, as evidenced by the embarrassing failure of Christopher Memminger's Cooperationists mission to Virginia in January of 1860. For some odd reason, a chapter reading of Road to Disunion reminds me of a narrative equivalent of an episode of James Burke's wonderful television series Connections (image at right from Wikipedia). Perhaps it's Freehling's deft integration of the important contributions of obscure figures into well known historical narratives. 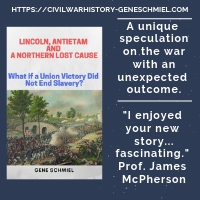 This new edition, as Scott predicted, is a much more balanced and detailed rendition of the battle based on hundreds of new primary source materials -- both Union and Confederate. It also encompasses a much greater time-span and covers in detail the myriad cavalry operations and other actions that, to date, have not been adequately covered. Civil War author Paul Taylor has converted his With Sword and Pen to blog format. It is nice to see a blog devoted to collecting. As I concentrate on current books and those written after 1960, I look forward to Taylor's informative posts about older volumes. Welcome, Paul. Originally set for June 07 and mentioned here previously, Darrell Collins's Jones-Imboden Raid study should be out quite soon from McFarland (hopefully in the next few weeks -- add. 8/27, the McFarland website lists it as available now). It appears it will be paperback binding only. The Athens manuscript from Camp Pope Bookshop is delayed, from the original August 07 target date to hopefully Winter 07/08. As far as I know, no publication date -- at least for the near future -- has been set for two highly promising and impatiently awaited Trans-Mississippi projects (Kyle Sinisi's book on the Price Raid and William Shea's history of the Prairie Grove Campaign). Sometime in the next few weeks (Sept 07), volume 2 of Earl Hess's series examining the role of field fortifications in the Civil War's eastern theater will be released. The title is Trench Warfare under Grant and Lee: Field Fortifications in the Overland Campaign (University of North Carolina Press, 2007). It's a projected three book endeavor. A review of the first volume, the superb Field Armies and Fortifications in the Civil War: The Eastern Campaigns, 1861-1864, is posted here. Collins: "Jim Lane: Scoundrel, Statesman, Kansan"
The subtitle of Robert Collins's new biography of James H. Lane speaks to the continuing controversy surrounding the "Grim Chieftain". Whatever one might think of him, Lane is an important military and political figure deserving of a full modern biography. While the range of opinion contains little middle ground, Collins does provide perhaps the most favorable view of Lane in the literature. Unfortunately, the author's writing and methodology do create unnecessary concerns for the reader. When discussing controversial aspects of Lane's life (ex. his birth, early stance on slavery, etc.) Collins lists the views of previous biographers and other sources, then adds his own commentary. Unfortunately, without footnotes, it is difficult to tell if the frequent equivocation on such matters is an admirable admission to the unknowing or a lack of deeper research into primary source materials by the author. The bibliography is limited in scope, with a heavy does of secondary sources leavened with newspapers and some manuscripts. Reading this book, few quotes from Lane himself will be found. While public friends and enemies spilled a great deal of ink, it appears Lane and his intimates left little behind in the way of correspondence and no journals. Only a handful of letters written by Lane are listed in the manuscript section of the bibliography. This dearth of insight into his moments of private reflection leaves us to view the man almost entirely from a distance. A popular notion in the literature (usually accompanied by little if any documentation) is that Lane was a personal friend of Abraham Lincoln. My own view is that Lincoln, consummate politician that he was, had a relationship with Lane better characterized as toleration for someone found to be quite useful in achieving a common goal. The author is willing to go further. While not delving into the matter deeply or convincingly, Collins reinforces the view of a mutually beneficial Lincoln-Lane friendship. Although some unsavory aspects of Lane's life (such as his shooting of Gaius Jenkins and corruption allegations against the senator) are dealt with in detail, Collins generally puts forth a favorable view of Lane, attributing much of his negative reputation to the imaginings of partisan political enemies. Disappointingly, other equally important controversies (such as Lane's 1861 raids into Missouri) are treated almost dismissively. Only a few paragraphs are devoted to the 'Sack of Osceola'. Perhaps the most useful part of the book is its last chapter, a nice survey of Lane historiography. It's a fairly detailed examination of the multitude of views about Lane in print and their evolution over time. 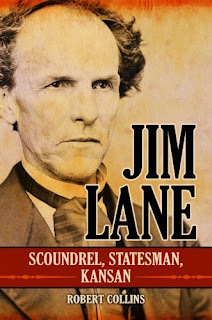 Jim Lane: Scoundrel, Statesman, Kansan is not a definitive modern biography, but its author does demonstrate a solid grasp of the published literature and has clearly spent a great deal of time in reasonable contemplation of his subject's place in history. However, the frequent equivocation and lack of documentation leaves readers with far more questions than answers and will frustrate those hardy souls looking to embark on their own inquiry. In the end, it seems that views of Lane will always be colored by the politically charged feud between the senator and Gov. Charles Robinson. There is a great quote in the book [pg. 185] from editor D.W. Wilder that sums up Kansas politics of the period, "On all public questions there is a Robinson version and a Lane version, and neither is the truth". I welcome comments about reviews posted on this site. However, while I don't expect readers to create a Blogger profile just to comment, I do wish them to be signed. If no profile, first name and last initial would be satisfactory. Completely anonymous comments will be deleted. I welcome private emails from authors and small publishers. Correspondence obviously (and in some cases rudely) seeking only free promotion gets discarded immediately, but I am happy to mention those entities and offerings that are in line with my own interests. A fellow blogger recently brought Edinborough Press to my attention. Some of its titles are familiar to me, but the publisher itself remained under my radar. Long time readers know I have posted frequently about books dealing with the 1862-65 Dakota War, and Edinborough has republished a couple accounts -- a German-American reminiscience titled Memories of New Ulm: My Experiences during the Indian Uprising in Minnesota by Rudolf Leonhart (ed. and trans. by Don Heinrich Tolzmann) and a compiled history The Indians' Revenge; or Days of Horror: Some Appalling Events in the History of the Sioux by Rev. Alexander Berghold (also ed. by Tolzmann). Haselberger: "'Yanks from the South!'" Published in 1987, this oversize, dense book remains the most detailed history available of the events surrounding the Rich Mountain phase of McClellan's 1861 Western Virginia campaign. Stylistically spare, Haselberger's text is micro level campaign study. At regimental (and often company level) scale, he covers the battles of Phillipi, Rich Mountain, Belington, and Corrick's Ford along with innumerable smaller skirmishes. There's a great deal of event coverage not be found in any other study associated with this campaign. However, Yanks from the South! is not without flaws. The most serious is the lack of footnotes. The author's assertion "that, generally, only the purists ever read or use the footnotes" is a sad and unfortunate concession to a type of reader not at all likely to read this kind of book. It really detracts from a work that should have been of more considerable value to students of the campaign. While I don't mind wooden prose (it's the meat I'm interested in), the indifferent copy editing was also a bit grating. More detailed leadership and strategic analysis would have been in order as well. Something should be said about the structure of the narrative, too. Rather than examining the viewpoints of both sides concurrently, the author chose to employ an alternating chapter method for the Battle of Rich Mountain and Garnett's retreat. It is similar to what Warren Grabau did for his excellent Vicksburg study Ninety-Eight Days , but more successful, in my opinion. Haselberger managed the transitions better and his text is far less repetitious. Happily, Haselberger included a number of fine maps, both original and adapted period maps. As the book covers so much ground, I only wish there were more, especially of the tactical variety. The appendices provided detailed casualty lists at various stages of the campaign and also a transcript of the inquiry into Porterfield's conduct at Phillipi. Flaws aside, I would recommend that anyone interested in the important 1861 Western Virginia campaign read Yanks from the South!. There really is nothing else that comes close to equaling this study's depth and breadth of coverage for this particular phase of the campaign. Jo Shelby's Iron Brigade -- by Deryl P. Sellmeyer. Jim Lane: Scoundrel, Statesman, Kansan -- by Robert Collins. Civil War Arkansas: Beyond Battles and Leaders -- edited by Anne J. Bailey and Daniel E. Sutherland. A Thrilling Narrative: The Memoir of a Southern Unionist -- by Captain Dennis E. Haynes, edited by Arthur W. Bergeron Jr. Portraits of Conflict: A Photographic History of Tennessee in the Civil War -- by Richard McCaslin. Confederate Guerilla: The Civil War Memoir of Joseph Bailey -- edited by T. Lindsay Baker. Robert E Lee at Sewell Mountain: The West Virginia Campaign (OP - Pictorial Histories, 1993) -- by Tim McKinney. Bradley & Dahlen: "From Conciliation to Conquest: The Sack of Athens and the Court-Martial of Colonel John B. Turchin"
Although he was a highly educated officer in the Russian Imperial Army and compiled a distinguished combat record in the American Civil War, John Basil Turchin is perhaps best known as an early advocate of “hard war” and—unfairly or not—the villain of the “Sack of Athens”. In their book From Conciliation to Conquest, authors George Bradley and Richard Dahlen begin with a short biography of Turchin and trace in some detail his command history from Missouri to Bowling Green, Kentucky and on south into Alabama. While operating in northern Alabama, Turchin’s brigade occupied the small town of Athens on May 2, 1862 and the men proceeded to vandalize and steal property from both businesses and private residences. No buildings were burned or permanently destroyed, but a young slave girl was raped. Army commander Don Carlos Buell ordered that Turchin be arrested and court-martialed for disobeying orders barring the unauthorized taking or destruction of private property and for conduct detrimental to military discipline and order. The military operations of Turchin’s brigade and the court-martial of its commander comprise the heart of From Conciliation to Conquest, but the authors skillfully weave other events into their narrative. The trial took place at the time the Lincoln administration’s conciliatory policy was crumbling, and Bradley and Dahlen explain the congressional push for harsher war measures and how the change manifested itself in the Senate’s confirmation process for new brigadiers. Ironically, Turchin’s nomination was confirmed during his trial, the paperwork making it through the War Department after he had already been convicted and dismissed from the service! As an aside, it doesn’t appear that the authors lend much credence to the oft-quoted Turchin declaration “I close mine eyes for two hours!”, in effect granting his men a free window in which to loot the town. Surprisingly, given its persistence, the authors devote only half a sentence to the alleged incident. In the end, from the trial description, it seems most likely that Turchin’s personal sins at Athens were ones of omission. The authors ask important questions. Was it even possible for volunteers, egged on from all sides by the harsh rhetoric of revenge espoused by newspapers, elected officials, and their own communities, to suppress these urges and carry out a viable policy of conciliation? The answer appears to be largely no, as the time necessary for instilling such a level of training and discipline in raw volunteers was just not available. Plus, none of their reasons for volunteering in the first place included anything approaching desires for conciliation. The overall dilemma is only compounded by the lack of a uniform direction from above and consistent punishment of offenders. Missing opportunities for early suppression of such activities, Turchin’s men were allowed to commit depredations in Missouri and Kentucky without repercussion. According to Bradley and Dahlen, these volunteers had little reason to think Athens would be different. From Conciliation to Conquest is superb history. With skillful placement of the sack of Athens within the context of the widespread use of volunteer armies for occupation duties and of the larger national policy shift from one of conciliation to hard war, George Bradley and Richard Dahlen have made an important contribution to the Civil War literature. Their expansive, evenhanded, and deeply researched account of the Athens controversy will likely stand the test of time. Highly recommended. My review was written back in December 2006 and I really believe this to be one of the best Civil War books published that year, an award-worthy effort. 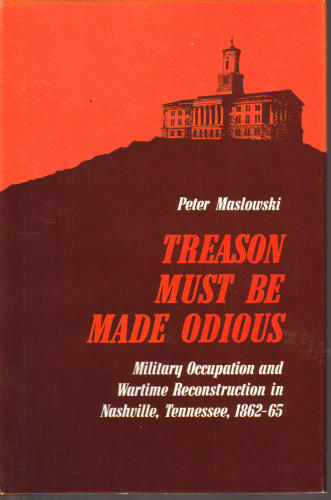 Treason must be made odious: Military occupation and wartime reconstruction in Nashville, Tennessee, 1862-65 by Peter Maslowski (KTO Press, 1978). Nashville: The Occupied City: The First Seventeen Months-February 16, 1862, to June 30, 1863 by Walter T. Durham (Tennessee Historical Society, 1985). Reluctant Partners: Nashville and the Union, July 1, 1863-June 30, 1865. (1987).